Starting just over $32,000 the 2017 Audi A3 is the least expensive car in Audi’s lineup, but don’t mistake it for a bargain-basement model. The 2017 audi a3 electric vehicle qualifies for a federal tax credit of up to $7,500, effectively reducing the net base price. The 2017 Audi A3 Sedan, Cabriolet and Sportback models have the unenviable job of squeezing the most basic parts of what makes an Audi an Audi into an entry-level vehicle. In the 2017 Audi A3’s case the goal has not only been met, but surpassed. Sporty and welcoming with a willingness to run, the A3 is a joy to drive, and the sportier S3 heightens both handling and acceleration. With standard leather seating, a panoramic sunroof and HID headlights, Audi’s 2017 A3 compact-luxury sedan gives cars like the Buick Verano, Acura ILX and Mercedes-Benz CLA a run for their money. Although the diesel engine is off the table this year, quattro all-wheel drive (AWD) remains, as does the electric A3 e-tron Sportback, a plug-in hybrid hatchback -- the line's new fuel-economy leader. Audi fans on a budget won’t be disappointed with what $35,000 can buy them. The A3’s styling isn’t as flamboyant as some rivals, but its sleek, conservative skin is exactly what attracts so many people to the brand. Available quattro all-wheel drive makes the littlest Audi even more enticing. If you’re looking for standout styling, a Mercedes-Benz CLA, BWM 2 Series or even a nicely equipped Mini Cooper makes a better choice. The 2017 Audi A3 isn’t big on back-seat legroom, and you get more features for less money buying an Acura ILX. Audi’s 2017 A3 undergoes a major refresh this year, with more angular styling and a host of interior upgrades and safety improvements. Audi’s Virtual Cockpit gauge cluster is now optional while the 2.0-liter engine is made standard on front-wheel-drive (FWD) cars, which also receive a new 7-speed automatic transmission. Audi’s A3 sedan for 2017 comes in four variations. 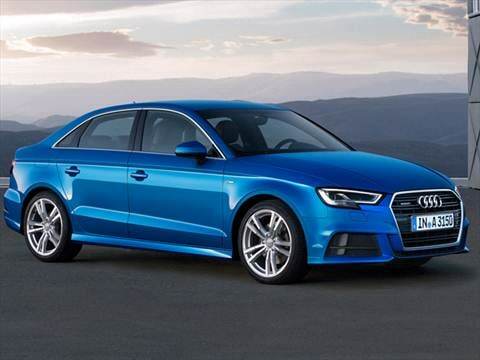 The standard A3 offers a nice blend of performance and value, while the sporty S3 pushes the performance envelope. The Cabriolet provides the open-air attitude of a classic roadster, and the A3 Sportback e-tron plug-in hybrid hatchback brings an extra measure of green-themed economy. The A3/S3 are first and foremost driver’s cars, with a strong emphasis on handling, acceleration and comfort, but at a price that undercuts many family sedans. The ride is smooth and controlled, the cabin quiet at highway speeds and the seats and driving position first-rate. The S3’s nearly 300-horsepower engine and quattro AWD devour twisting turns like a starving student at a Golden Coral buffet. The base FWD A3 is now equipped with the 2.0-liter turbo good for 220 horsepower. And while we find the new 7-speed dual-clutch S-Tronic automatic to be more than up to the job, a car this size really deserves the option of a good 6-speed manual. If you like your road tunes loud, Audi’s 2017 A3/S3’s optional Bang & Olufsen audio system is a must-have. With 705 watts channeled through 14 speakers, this audio upgrade doesn’t come cheap, but to an audiophile it’s worth every penny. Audi’s commitment to safety is in full view with the available adaptive cruise control. Not only can the system regulate speed to keep a safe distance between the A3 and the traffic ahead, it can actually bring the vehicle to a full stop all on its own. Audi has set a high bar with its interiors, with high-style design and immaculate fit and finish. Yet while the 2017 A3 scores well on materials and assembly, it's a little on the bland side compared with other Audi vehicles. That said, it's cleanly designed and suitably sporty, with simple audio and climate controls. We wish the MMI infotainment interface wasn't placed quite so low on the console though, as it makes it hard to see which button does what until you've learned it by touch. Not surprisingly, rear-seat accommodations are pretty tight, especially for three passengers. If you like the Audi styling aesthetic, you'll love the 2017 A3’s new look. Looking a lot like a smaller Audi A6, its standard bi-xenon headlights, big sunroof and standard 17-inch aluminum-alloy wheels make even the least expensive A3 look great. Bigger 18- and 19-inch wheel-and-tire upgrades jazz up the exterior, and S3 models offer unique styling touches to emphasize the sportiness. Under the short rear deck is a 12.3-cubic-foot trunk, which reduces to 10 cubic feet in all-wheel-drive models. Convertibles of course offer two doors, and look especially sharp with the power soft-top lowered. Standard on every 2017 Audi A3 are a rearview camera and rear-parking sensors, along with heated mirrors and windshield-washer nozzles. Other standard equipment for the sedan includes leather seats, a panoramic sunroof, bi-xenon headlights, dual-zone automatic climate control, 12-way-power driver’s seat with power lumbar, LED taillights, Bluetooth with audio streaming, 10-speaker audio with single CD player, sensors for automatic windshield wipers and headlights and a 7-inch audio/information screen controlled by Audi's MMI interface. Opt for the sporty S3 and you'll get more power, along with quattro AWD, 18-inch alloys, a flat-bottom steering wheel, and a sport-tuned suspension. If you'd like to make Audi's inexpensive A3 as pricey as possible, Audi is perfectly happy to help. There are LED headlights, heated seats, an excellent Bang & Olufsen audio system, and a navigation system with Google Earth map technology. The last of those includes a clever touch pad atop the MMI knob that recognizes handwritten text entry. Dynamic safety features include active lane-keep assist, blind-zone warning, and dynamic cruise control. Lastly, S3 models can be had with a $1,500 Magnetic Ride Control suspension system featuring three driving modes: Dynamic, Comfort and Individual. Multiple engine configurations confront prospective Audi A3 owners. Front-wheel-drive models get a new 2.0-liter turbocharged 4-cylinder, an upgrade from last year's smaller engine, now boasting 186 horsepower which gets to the front wheels through a dual-clutch 7-speed automatic transmission. If you want quattro all-wheel drive, you'll get an engine upgrade as well: a 2.0-liter turbocharged 4-cylinder with 220 horsepower, as well as a 6-speed dual-clutch automatic (which is also used in the econo-oriented A3 Sportback e-tron plug-in hybrid). Audi S3 models get a version of the 2.0-liter engine that sends its 292 horsepower to all four wheels. Note that both the A3 and S3 require premium fuel. The base 2017 Audi A3 carries a Manufacturer’s Suggested Retail Price (MSRP) of about $32,200. Opt for quattro all-wheel drive and the price jumps to just under $35,200. The 2017 A3 Cabriolet starts at about $38,600 for front-wheel drive, or $41,300 if you want all-wheel drive. Greenies can get into a Sportback e-tron for $39,850, and the power-hungry will gravitate to the $44,000 Audi S3. Note options and trim levels can add considerably to the price tag, making your "cheap" Audi cost more than $50,000. The Mercedes-Benz CLA starts slightly lower, but with less standard equipment. The Acura ILX and Buick Verano are both thousands less, but without the pedigree brand or AWD option. Check KBB.com's Fair Purchase Price calculator to see what others paid in your area. As for resale value, the A3 isn't expected to hold up over the long haul as well as the CLA, or even the ILX. 2018 package pricing is a huge let down!